I did something last Friday I’ve never done before. Matt and I took an excursion day with some friends to WonderWorks – a great place to try new things and let your imagination run wild. (That’s what their tag line tells us!) And it really is a super place with a whole lot of science-ey fun stuff to do. One of the adventures is their Canyon Climb Adventure. Now I want to point out here that when we go to places with new adventures like this I usually volunteer to watch the little ones while the big kids and hubby go do something crazy like swim in a glacier lake. But because no little ones were around and I really had no other excuse, I took on the adventure with Matt and our friends. 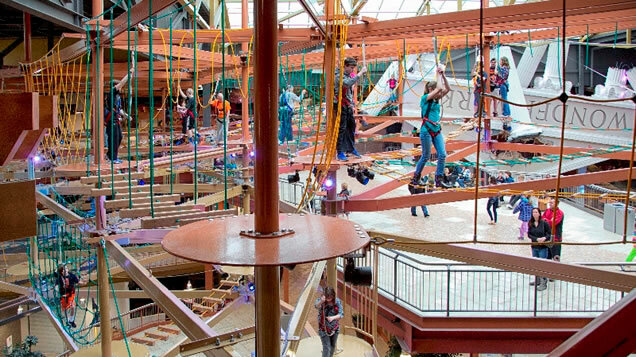 WonderWorks takes family fun to new heights with the World’s Largest Suspended Indoor Ropes Course. 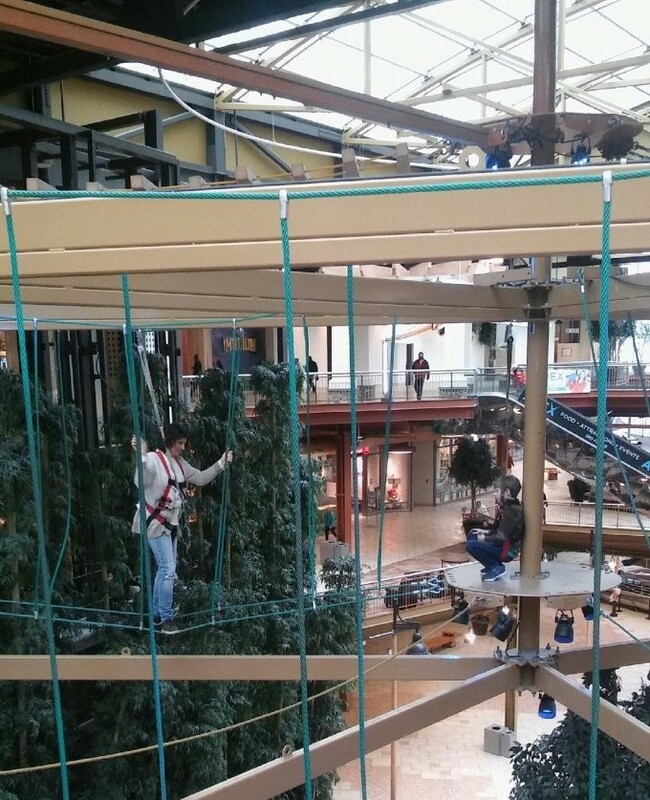 Standing 70 feet tall, visitors will explore 3 levels of ropes as they encounter over 81 different obstacles. Activities include swinging steps, lily pads, a tremor bridge and more. Conquer your fears and get an adrenaline rush! I actually didn’t know this information when I signed up for this adventure. I had gone through a different entrance and hadn’t seen this course. A quick Google search would have told me but I was just going along with the gang, signing waver forms and letting some stranger named John harness me into a contraption that was going to allow me to hang from a height 3 stories above the main concrete floor of the mall where shoppers were innocently strolling along unaware that a crazy woman in her late 40’s was precariously hugging a giant steel beam high above them. Of course Matt and his friend took right off. Their brains have not developed to the point of grasping the real sense of danger or evaluating the long-term consequences of walking across a tightrope suspended high above the ground floor. That’s actually a good thing. It’s how kids learn to take risks and not let their fears rule the day. It’s why they run and jump off picnic tables in their backyards believing they can fly because they have a sheet tied around their neck and a bicycle helmet on their head. I believe it’s this kind of faith God asks of us. I am, by nature, not a risk taker. I like my feet solidly placed on firm ground. I find comfort in knowing the plan and having the risk analysis and percentage outcomes calculated. So this ropes course was a big deal for me. My mind swirled with imaginative outcomes of me stepping off the disk and onto suspended ropes. I decided walking a 6 inch wide metal beam to a neighboring circular disk wouldn’t be too bad. And I did it! That accomplished feat built my confidence to try another challenge with ropes and scattered square boards. But that first step was quite a doozy! I literally stood on the secure circular disk putting my foot out towards the board but… boy, was it far away!! To complete that first step I would have to lean my body forward and commit fully to that first step…. then what would happen? The problem was when I looked down to see where to step I could also see tiny people far below walking past. Aaack! One step at a time I made it across to another secure circular disk. Whew! My friend met me there and we stood watching the boys move with ease from one rope obstacle to another. So I was left standing alone with my thoughts and fears swirling in my head. My mind could imagine all kinds of scenarios. None of which were taking place… but they could have and that was enough to keep me standing still and not stepping out. And that’s when I decided to do something about all that. My friend snapped these pictures of me making my way around. You can see Matt encouraging me from the circular disk. I did make it all the way around. And this is what I discovered through the whole process. Those first steps off the secure ledge were the scariest. 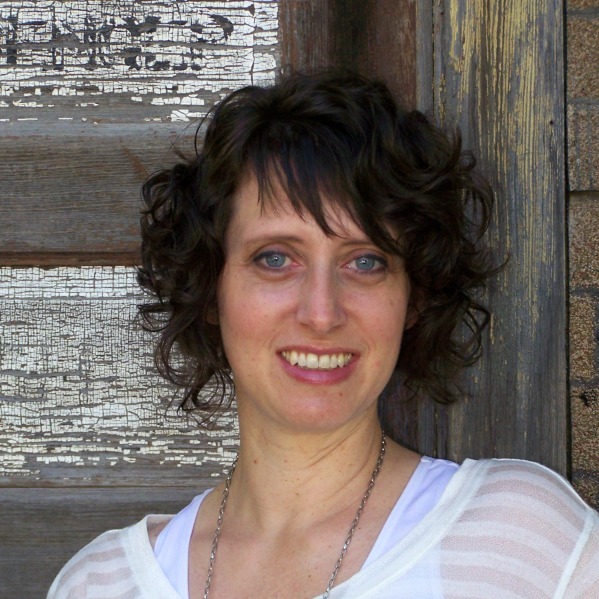 Focusing on the next step forward and not the “what-if’s” in my head got me to the other side. I took the challenge on with trepidation but soon discovered that I could do it and the steps conquered brought confidence to take another step. It’s like our faith journey with God. He places us on a course and asks us to step out. It can be scary. And the new challenge of going places we haven’t been before can be a little out of our comfort zone. But it doesn’t mean it’s impossible. Believe you can– Our mindset can stop us before we even get started. We can think of all the things that can go wrong before anything even happens. Trust the One who planned the course and makes your way secure. The Psalms tell us again and again how God leads His people, makes their way secure and guides them to safe places. We need to remind our selves of the Great God we believe in. 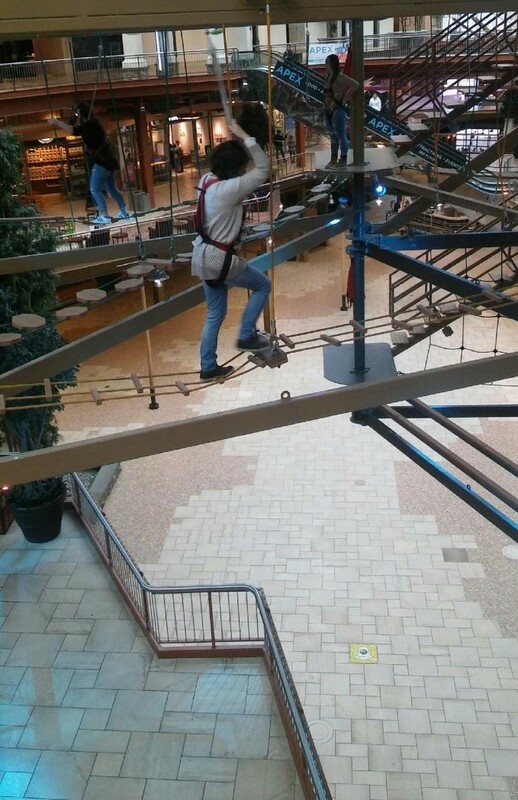 Rely on the support given – On this ropes course, it would have been foolish to take on the challenge with no harness or safety measures in place. Our faith journey is the same way. Sometimes we think we are alone and we take on this mentality of going it alone but it doesn’t have to be that way. Leaning into God and those around us gives us the support we need to keep going. Don’t do this life alone. Take the first step even though it’s a doozy – Just getting going and making that firm decision to do it is sometimes the hardest step. Once we get past that initial fear of starting we find we can do it. And we didn’t die in the process. Taking the next step is easier because we have the assurance that we did it before and we can do it again. I don’t know what new adventure God has for you but I do know He is with you in the process. He’s laid out a good course, with possible scary steps and difficult challenges, but also full of adventure with new ways of gaining confidence and big high-fives! This whole next year is ahead of us. Let’s step up for a doozy of a challenge and see where it takes us! « What Is That Under My Skin?